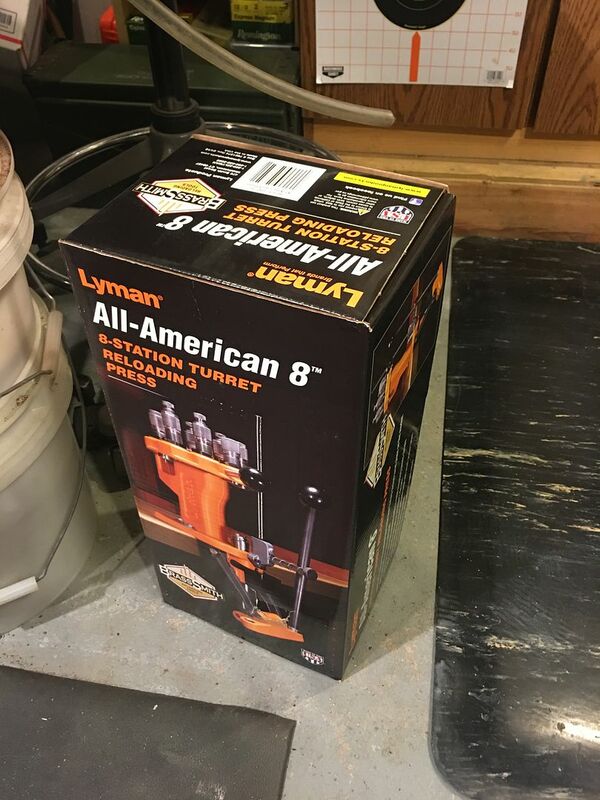 I'm thinking of selling my two Rockchucker II presses and getting the Lyman Brass Smith All-American 8-Station Turret Press. I guess we all sort of fall into comfort zones, and I've been loading on single stage presses now for almost forty years. Other than that I really haven't been keeping up much with what is new out there since I've been happy with what I have. Except until six years ago when I went and got the Hornady L-N-L AP.But I use that mostly for my handgun ammo, and I have a few rifles I load for and would like to not have to rip down the AP so often for doing the rifle loads........So, I'm thinking the smart way to go is upgrading to a NEW press of turret design. Lots of advantages when applied to the rifle loading, Most bottle neck are two die, that means I can keep four calibers on one turret head. Extra heads are around 45 to 50 bucks a pop and two or three extra would keep most of my shooting calibers on a head ready to go and all set up and adjusted. How about some thoughts on this new press and the pro's and con's of my moving in this direction. I would keep the rock chuckers. I still use my single stage presses for things. I use the turret more though. But 1 of my single stage i use as a dedicated decapping press. The other 2 now and then i do other things on. Also my son uses them to load rifle. He's not comfortable with the turret. I have a turret press and you are correct in my opinion it is great having multiple rifle dies set up and just swap out heads. I would suggest keeping a rockchucker around for other stuff I end up still using my RC for many things even though I have the turret press all set up. I’d keep the RC for small one of jobs. Very handy to do like said de prime opps. Short runs or load work up. My money tree seems to be ok but I have never been one that has to have the newest thing out there. I’ll let the crowd go first and then see what happens. Never liked change just for the sake of change but I can accept change that’s an actual improvement. There are way too many engineers out there who have to justify their jobs[no offence to any engineers out there]. Horizontal fins to vertical fins for example. Looking at the new rcbs and Lyman turrets and I don’t like the priming systems on either. Looks like they’re in the way of everything. The primer feed tube on my old T-2s moves with the turret while the priming arm except when in use is flipped out of the way. I will say that it did need to be tweeked some to get it to work right but now it works fine. Just a matter of chamfering the primer cups and shell holders and deburring the aluminum feed tube assembly. I always prime on my dillon and T2 presses but for someone who hand primes the new press priming issues I see are moot. I do use a single stage for my big 30 cal rifle ammo and hand prime these. They’re many ways to skin a cat[no offense to cat people]. I would keep the two Rockchucker II presses and buy a Dillon 550, both companies have great customer service, not so much Lyman. I decided on a Lyman just before Christmas... Just bought it last month. Its mounted but I have yet to really load on it. I like it so far, wanted a T7 for a long time this was less than 1/2 the cost and not half the press! Same here, been loading since early 1970's and do mostly single stage. Altho my Dillon 550 runs mighty smooth when I need it. OOh DONT sell BOTH the RC's!! I wouldn't sell EITHER, but I recommend you save at least one! I have the old Lyman T press to hold 6 dies and works for me. When I start to do 308 win and got some LC brass and how hard it was on the press to deprime and resize the cases on the press I got a used Hornady single stage press.So it all work out for me. I say also keep the single stage press you got. You will be happy in the end that you did . There is one thing on the old Lyman T press that the screw that hold the plate in place the company dose not have any replacement for it,So that is why I got the single stage to do what it dose . Logic seems sound to me! 2 dies per rifle caliber until you start seating cast bullets which want an M die or similar. Not saying not to buy a turret as I have a Redding T7 but also use three single station presses and two Dillon 550s to good advantage. Get a turret but I think you may want to reconsider your planned procedures. I would keep the RockChuckers as well. Always good for re-sizing bigger cases or small runs of cartridges. I have two Hornady LnLs up and running and am considering getting a Dillon 550 or 650. I am also intrigued by the idea of a turret press but not sure I want to buy a Dillon and a Lyman or Redding turret press. The video that Ultimate Reloader did on the Lyman 8 station turret certainly makes it tempting to acquire one. I have a Dillon, which I really like, but my three Rock Chuckers are still on the bench. One is only used for decapping. The other two get changed a lot. One RockChucker is enough, if you have 3 or 4 other single stage presses. A c frame press is plenty good enough for de-priming, bullet seating, or any other loading chore than case forming. Save the Rock Chucker for when it is needed and it will last forever. Well thank you one and all. I must admit to being kind of a hoarder when it comes to my hand loading stuff, I've never sold or gotten rid of anything I have ever purchased except a set of collet dies that I did not like. I just get real attached to my stuff, so again thanks for all the good reasons for keeping my Rockchuckers. I'll just work a little overtime so I can add the turret to the family. Someday, whenever we get settled again, I will snap a shot of the reloading space and my setup, until then it is a c clamp at the kitchen counter in our rental, it will just have to do. Again, thanks for the insightful opinions. Nothing wrong with a C clamp, I have a small reloading bench and my 550 is bolted down but I bolt my Rock Chucker to a 2"x10"x16" board and C clamp it to the bench.